A traditional feel to the Bar Hemingway, named after the author Ernest Hemingway, this prestigious bar is located within The Ritz Hotel on the Place Vendome where whiskies and cocktails are the order of the day. Incredibly, when The Hotel Ritz was first opened it did not have a bar, but with many fleeing from prohibition America, such as F Scott Fitzgerald, Cole Porter and Ernest Hemingway, Cesar Ritz soon realised that a bar was needed and it opened in 1921 for men only. 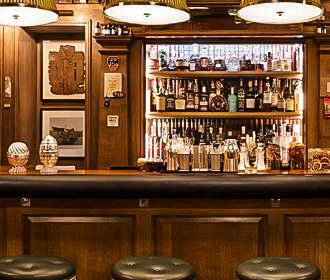 However, with the success of the first bar and then when wife of Cesar’s son invited herself in one day, it was decided that a second bar would open in 1926, which was called the Petit Bar and initially was reserved for women only. Over the years things changed with men and women mingling together within the bars, and it was in this cosy intimate atmosphere that Cole Porter would spend up to nine hours here daily, F Scott Fitzgerald had a favourite seat, plus Ernest Hemingway and Gary Cooper made it their epicentre where they would talk for hours and hours. 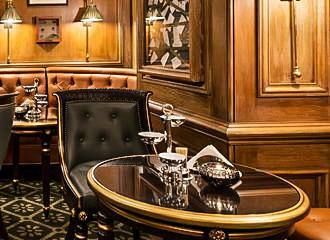 They say to drink in moderation, but Ernest Hemingway was excessive, over indulging, and legend has it that he liberated this bar at the Ritz Hotel from the German soldiers in 1944 by downing 51 dry martini’s in a row, which was while Paris was under occupation during World War II. 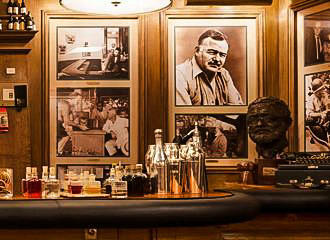 The legend of Ernest Hemingway and his association with the Petit Bar continued and in 1994 it was renamed the Bar Hemingway in his memory, which has a vast amount of memorabilia from his travels, along with old photographs adorning the wall. 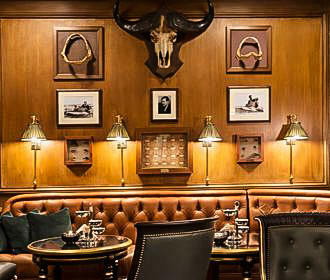 With a very traditional setting of wood panelled walls complemented by the leather sofas and deep leather chairs, the Bar Hemingway became an iconic place to enjoy a drink, with a vast amount of whiskies including many single malt whiskies that were one of Hemingway’s favourite drinks. However, the well recognised head barman, Colin Peter Field, has created an extensive range of cocktails including many of his own signature creations with a philosophy of the cocktail being memorable for the eyes, nose and palate, which sees numerous people coming back time after time to experience these. Yet the Bar Hemingway was closed for a period of four years while the entire Ritz Hotel was being completely renovated, but since reopening in 2016, in the same traditional style with a cosy atmosphere and even more Hemingway memorabilia such as his old fishing rods, there are often queues of people just waiting to be served by Colin Field or one of his very capable staff. Tapas is also available, yet something you would not expect to find is the fact that hotdogs are also on the very limited snack menu, but it is the cocktails at approximately €30 per one combined with the nostalgic atmosphere that draw people to experience the Bar Hemingway, along with seeing Colin Field in action, who earned the title of Best Barman in the World. As we mentioned before, the Bar Hemingway is located within The Ritz Paris Hotel, which is towards the back of the historical building that is located in the 1st Arrondissement of Paris on the Place Vendome. Open daily from 6pm through to 2am, the easiest way to access the Bar Hemingway is via the entrance on the Rue Cambon as it is located directly to the right of this entrance, rather than having to go through the entire hotel from the main entrance and via the gallery. We would also like to point out that It is a small intimate bar, so therefore it can get extremely busy, plus we would not advise turning up in very casual wear, due to the nature and prestige of this place, which sees people visiting from all over the world. When it comes to reaching the Bar Hemingway, the nearest Metro station is the Opera stop serving lines 3, 7 and 8, although the bus lines 52, 72 and the Noctilien Night Bus lines N11 and N24 will also get you within walking distance.